Tonight I decided to run yet another test to dial in the gravity and volume calculations for my sous vide based brewing setup. Since I had a Dubbel, Tripel, and Quad fermenting, doing a Trappist Single seemed like a good next step. I have a Single recipe that I've been pretty happy with, but still wanted to tweak it a bit more. This was a good chance to make those tweaks and see work on the calculations at the same time. 0.15 oz. Styrian Goldings hops pellets @ 6.2% AA 60 min. 0.25 oz. Czech Saaz hops pellets @ 3.2% AA 15 min. 0.20 oz. Czech Saaz hops pellets @ 3.2% AA 5 min. The mash for this batch was done in a Ziploc bag, inside a stock pot full of water, to which the sous vide cooker was attached. The sous vide cooker's temperature seems to be about 2 degrees below what it registers (i.e., if it says 156F the actual temp is 154F). The contents of the Ziploc tend to be 3-4 degrees below the surrounding water (i.e., if the water is 156F, the bag's contents will be 152-153F). Using this information, I adjusted the temperature settings so that I hit my intended mash and mash out temps. The mash was conducted for 40 minutes at 156F, followed by a 10-minute mash out at 168F. 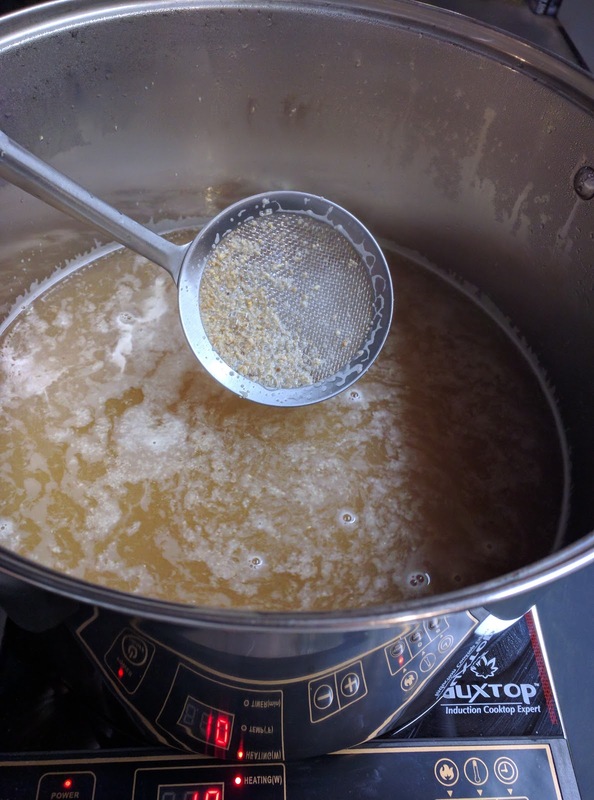 The grain was emptied from the bag into a strainer placed over the stock pot used for boiling. As the grain drained and was sparged, the stock pot was heated to boiling. Because I was trying to nail down calculations, I took a moment to measure the pre-boil volume. It came out to 1.56 gallons versus the expected 1.64 gallons. Pre-boil gravity was 7.0 Brix versus the 9.0 Brix calculated by BeerSmith. I achieved a post boil volume about 8-10 ounces short of the expected 1 gallon. I'll use this info to tweak my calculations. Trying to keep things simple, I transferred the wort into my plastic pitcher and placed it inside the mini-fridge to chill to yeast pitching temperature. This will likely result in a cloudy brew, but my goal here was to check the flavor of the recipe and sort out calculations - not brew the clearest beer i could. I had harvested a bunch of Wyeast 3787 from the BJ's Grand Cru clone I did last month, so I used some of that to ferment this beer. If you've never used this yeast before, I strongly recommend a blow-off tube. I've experienced some amount of blow-off with it regardless of the amount of head space, volume of wort, or gravity. I set up a blow-off tube for this beer from the start. The goal is to ferment the beer at ambient temperature with no temperature control for the first week, after which it will be moved to an insulated and heated chamber. In there, it will be kept at 76F for another week or two until fermentation seems to have stopped. After that, it will be bottled. After my least batch in the sous vide setup, BeerSmith calculated my efficiency at 75% for the batch. This time around, I used 75% as my estimated Brew House efficiency. After completing the measurements, BeerSmith says I hit 71% efficiency for this batch. 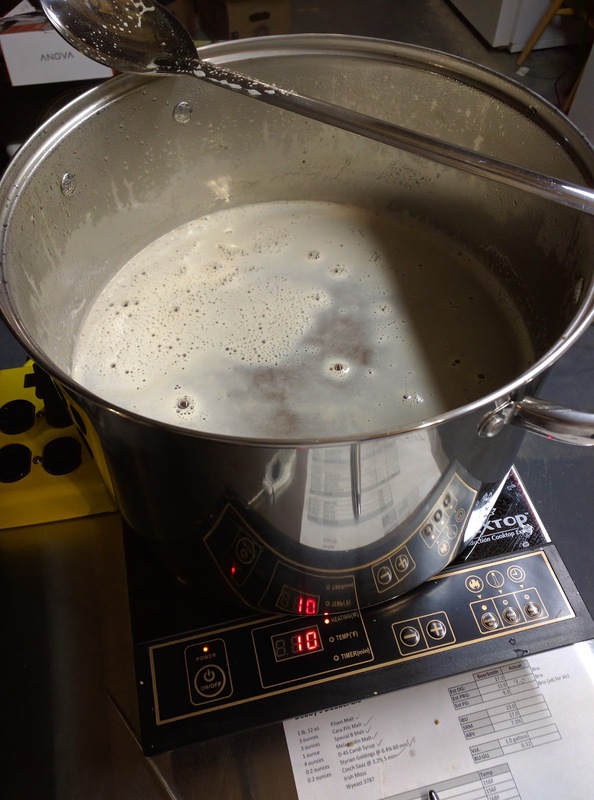 I estimated boil-off for the setup at 0.64 gallons per hour. That's exactly what I achieved on this batch, going from 1.56 gallons to 0.92 gallons after a one-hour boil. It looks like I probably needed about another 8-10 ounces of sparge water to hit the pre-boil volume on the nose. Given that I used 2.5 quarts of water for mashing and 4.5 quarts for sparging, that's 7.0 quarts total. My pre-boil volume measured as 1.56 gallons or 6.25 quarts. This means the grain soaked up approximately 0.75 quarts. That is 0.75 quarts for 1.69 pounds of grain or 0.44 quarts per pound. I modified my spreadsheet to calculate future sparge volume based on 0.44 quarts being absorbed for each pound of grain. One thing I have noticed about this setup in the last few batches is that it tends to not strain out all the bits of grain. A certain amount ends up in the boil. This is something to be addressed in a future run with the system. Update 07/25/2017: The beer has a thin krausen on it now. I'm not sure if it's hit the height of its fermentation or not yet, but there is very visible activity in the fermenter so I am not complaining. It's beginning to lighten in color a bit, too, which is a sure sign that fermentation is underway. Update 08/12/2017: The beer has been bottled using Cooper's carbonation drops and has spent two weeks conditioning at 78F in the bottle to ensure carbonation. It pours with a light level of carbonation, consistent with the carbonation drops but of course lower than a typical Belgian beer. It pours an amber color, with a thin head that dissipates quickly. The aroma is mild, with hints of fruit and spice. The hops come through pretty clearly in the flavor, which is expected for this style. I'll need to scale the recipe up to see if I am convinced it's better than previous attempts at a Single, but so far I'm hopeful. Style Definition: Medium Trappist yeast character showing fruity/spicy/floral notes. Low grainy-sweet malt backdrop, possibly with light honey or sugar quality. My Version: Yeast character comes through clear, definite fruity notes, with malt there if you look for it. I'd score it an 9 here. Style Definition: Pale yellow to medium gold color. Generally good clarity, with a moderate-sized, persistent, billowy-white head with characteristic lacing. My Version: Definitely on the medium gold side, maybe a touch too dark. Clarity is decent but there is a slight haze. The large white head lasted a while but is not leaving behind lacing and wasn't what I'd call "billowy". I'd score it a 2 here. Style Definition: Fruity, hoppy, bitter, and dry. Initial malty-sweet impression with a grainy-sweet soft palate and a dry, hoppy finish. The malt may have a honeyed biscuit or cracker impression. Moderate spicy or floral hop flavor. Esters can be citrus (orange, lemon, grapefruit), pome fruit (apple, pear), or stone fruit (apricot, peach). Light to moderate spicy, peppery, or clove phenolics. Bitterness rises towards the crisp, dry finish, with an aftertaste of light malt, moderate hops, and yeast character. My Version: Starts mildly sweet and citrus, then dries out and becomes bitter and clean at the finish. The aftertaste is mostly hops and a hint of yeast. A hint of biscuit malt. Floral hops come through. I'd score this a 16. Style Definition: Medium-light to medium body. Smooth. Medium-high to high carbonation, can be somewhat prickly. Should not have noticeable alcohol warmth. My Version: Definitely medium-bodied. Not heavy or thick, but not watery. High carbonation, on the effervescent side but not what I'd call prickly. No alcohol warmth. I'd score it a 4. Style Definition: It should be a pale, bitter, dry, and well-carbonated beer with a fruity yeast character, spicy-floral hop profile and soft, supportive malt palate. My Version: It's more gold than pale, coming in around SRM 6 by my best guess, so it's a little darker than the style wants it to be. It's mildly bitter and well-carbonated, and the fruity herbal/floral hop profile is definitely here. If I was a judge rating this for another brewer, I might score it a 7/10. How would I improve the score? On the aroma side, maybe increase the last Saaz addition by 25% or so, or add one closer to the end of the boil so that the aroma is enhanced a little. This would also bump the bitterness up a tiny bit, which wouldn't hurt against the style definition. On the appearance end, I'd make sure it received gelatin finings before bottling to clear it up a bit more. I'd also swap some of the Pilsner malt for some Cara-Pils to try to improve the lacing. I'd like to add more Melanoidin, but that might bump the color up too much. For mouthfeel, maybe a touch more carbonation. On the flavor side, increase the hops addition a little, but not much. It definitely tends toward hops right now, but could maybe use a slight nudge to get closer to the guidelines. Other than the above, I think I've done as well as I can with this one. Back in October 2016, I brewed a Belgian Dubbel I named after my later mother. It's one of my wife's favorite beers I've made, but sadly not one of my own. I liked it, but I believed it could be much better. Tonight, I tweaked the recipe a bit and brewed a one-gallon batch of it. I used the Sous Vide cooker to handle mash and sparge water, and an induction cooktop to perform the boil. While I'm still working out volume and efficiency calculations on the setup, I'm getting a little closer each time I do it. So, unfortunately, I overshot the volume about 20% and ended up 15 SG points lower in gravity. These are things I'll need to adjust my calculations for in the future. For this recipe, I placed approximately 3 gallons of water in a stock pot and attached a Sous Vide cooker. I set the cooker to 156F and let it heat the water to temperature. When it was at temperature, I measured 3.5 quarts and put that in a plastic zipped bag and placed the bag back in the stock pot, clipped to the side. When the water in the bag reached the mash temp, I stirred in the grain. A 60-minute mash was performed, after which an iodine test confirmed conversion. The cooker was set to 170F and left for 15 minutes to heat. 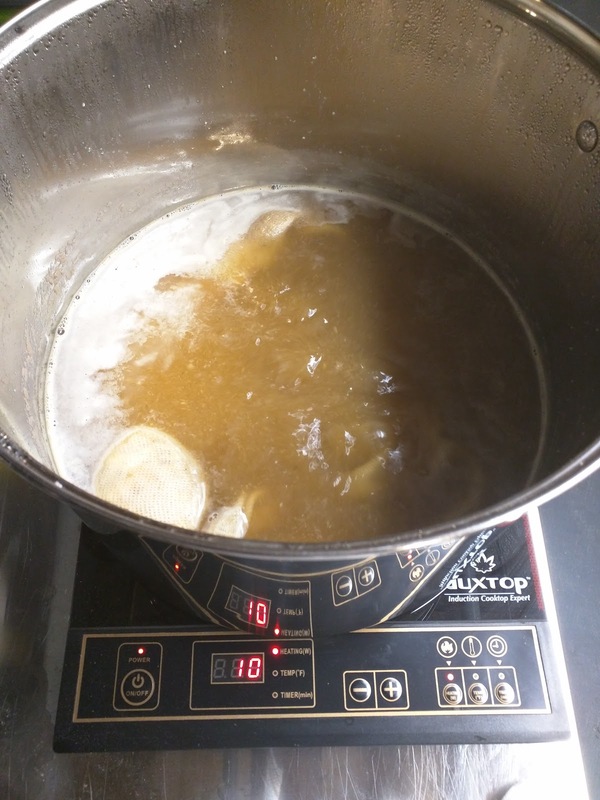 After 15 minutes, the wort was at a mash out temperature, so I turned off the cooker, removed the bag, and emptied it into a strainer over a 4-gallon stock pot on my induction cooktop. While the grain drained, I turned on the cooktop. Leftover water in the stock pot was used to sparge the grain. By the time the grain was sparged, the wort was at boil. Pre-boil volume was not measured, but pre-boil gravity was 9.0 Brix, lower than the 11.0 expected. When the wort had cooled down a bit, it was poured into a glass fermenter. I measured the final wort volume at 1.2 gallons and 14.0 Brix (1.057 SG) gravity. To maximize the esters and phenols associated with the Belgian yeast, I decided to let this one ferment at whatever temperature it reached. After a week, I'd place it in a warm location and keep it around 76F for another week. Including some interruptions, I completed this batch in under four hours elapsed time. That's much quicker than I've done a 5-gallon batch. The time also includes cleanup. Since I am still working out the details of the one-gallon setup, I wasn't surprised to see that I overshot the volume slightly (though much less than most of the brews I've done with it to date) and undershot the gravity. Brew house efficiency on this batch worked out to about 75.4%. I think I'll use 75% as my expected efficiency from here on out and see if I get closer to my goals. Update 08/12/2017: The finished beer is very drinkable and smooth. However, it's a far cry from the flavor profile I wanted. It's basically a malty, caramel-ish, very mildly sweet brew with hints of Belgian yeast attributes. The dark fruit flavor and medium body I was looking for isn't here. Time to go back to the drawing board and make a v3.0. 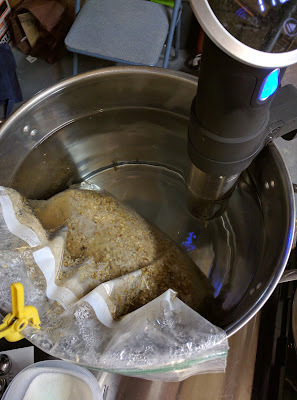 I've been trying to perfect a one-gallon brewing system that uses a Sous Vide cooker and induction cooktop to produce all-grain beer. I've made four batches with it so far. The first batches were all reasonably good but did not hit their gravity or volume targets. I've been trying to dial that in for a while but haven't had much success. Today I decided to brew a scaled-down recipe from the Candi Syrup Inc. web site. This is their clone recipe for Affligem Abbey Tripel, with cane sugar replacing the clear candi sugar in their recipe. 0.15 ounces UK Challenger hops @ 6.8% AA 60 min. 0.20 ounces Styrian Goldings hops @ 2.8% AA 60 min. 0.20 ounces Styrian Goldings hops @ 2.8% AA 15 min. 0.15 ounces Styrian Goldings hops @ 2.8% AA 3 min. 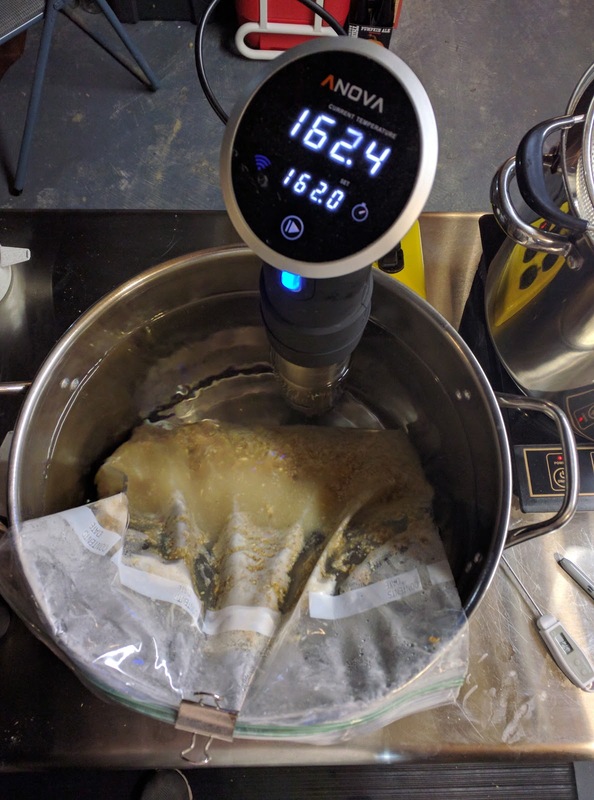 The mash water was placed in a 2-gallon Ziploc bag and clipped to the side of a 4-gallon stock pot filled to a level within the Anova Sous Vide cooker's operating range (which took about 2.75 gallons). This was heated to mash temp and when the water inside the bag was within a degree of the surrounding water, I added the grains. Mash began at 149F and ended with a mash-out at 170F. The bag was emptied over a strainer, over another 4-gallon pot. I had a bit of an accident and scaleded myself pouring the wort out of the bag into the strainer, and ended with some wort and grain on the table around me. Fortunately no hospital visits were involved. This may have had some impact on efficiency this time around. Hard to say. Grain was sparged up to the 1.6 gallon level and the grain discarded. 1 gallon of mash water was used, and 6.8 quarts of sparge water were used (approx.). The post-boil gravity measured 15.0 Brix or 1.061 SG, well below the expected 1.082 SG. Was that due to the spillage of grain and wort? Maybe. Either way, efficiency works out to about 56% on this batch, which is way below what I've been seeing in this setup. I managed to squeeze in two brewing sessions today, both with disappointing results. In both cases, my efficiency was well below what it normally is. I could blame grain crush, since the earlier brew that hit 47% efficiency used grain I crushed myself. 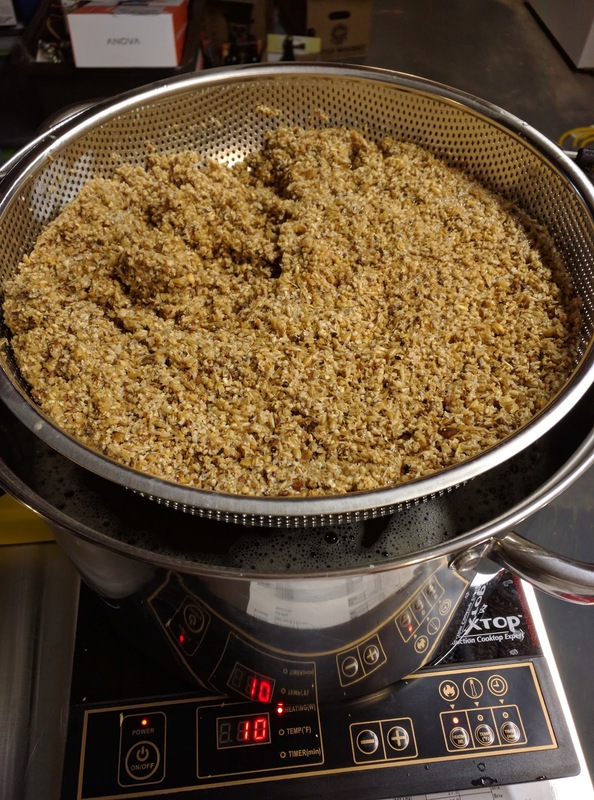 But this batch used almost entirely grain crushed when purchased, and only hit 56% efficiency. Even when I used only store-crushed grain, I never saw such low efficiency. Something else must be at fault here but I haven't figured out what yet. The spill of 170F wort and grain on my arms, hands, and work table was a bit of a disaster. I'm not sure quite what went wrong there. Maybe too much stuff in the bag? Maybe I wasn't careful enough opening it? Hard to say. It's something I need to figure out before I do myself some serious damage. Update 08/12/2017: The finished beer is actually pretty good. I think if I scale this up to a full 5-gallon batch I might have the good "base Tripel" recipe I have been looking for. In the next iteration, I'm thinking I'll replace some of the Belgian Pilsner malt with Cara-Pils to improve the head retention, add some sweetness, and improve the body a little. I might also mash the grain at a slightly higher temperature the next time around, too. Unfortunately, I haven't seen the real Affligem Tripel on store shelves in Ohio so I can't compare it to the real thing. The Gulden Draak and Gulden Draak 9000 Belgian beers are two of my favorites. I've made a few unsuccessful attempts to brew Gulden Draak, but before today had never tried to brew Gulden Draak 9000. I found the recipe on the Candi Syrup, Inc., web site and acquired the ingredients. Earlier in the week, I began culturing up White Labs WLP510 Bastogne yeast to make sure I had enough available to brew the beer successfully, a 4L starter took care of that. Since it's pretty typical for me to hit my gravity and volume targets, being over a half a gallon off in volume and 27 gravity points low was disturbing. I will be looking into this more. BeerSmith says my efficiency for this batch was 47.6%, which is a new low. This yielded only 5.75 gallons of wort in the kettle, instead of the expected 6.6 gallons. This means I need to revisit my calculations, I think. Pre-boil gravity registered a mere 12.2 Brix instead of the expected 20.0 Brix. Post-boil volume was 4.9 gallons at 17.0 Brix gravity, well below the expected amount and volume. Wort was pumped through The Grainfather's counterflow chiller into a stainless fermenter where the yeast from the 4L WLP510 starter were waiting. Although the original recipe called for a starting fermentation temp of 62F, I couldn't get the beer below 76.4F. After approximately 4 weeks, the beer will be transferred to a secondary fermenter or a bottling bucket... as yet to be determined. Update: After roughly 3 hours in the fermenter, I'm already seeing significant activity in the airlock, so I suspect the yeast are happy in their new home. This was not my best brew day. I made my first attempt to brew using the new Grainfather Connect controller and Android app. Importing a BeerXML file from The Grainfather recipe site resulted in the app wanting to set mash temperatures well above boiling (255F in one case). Importing one from BeerSmith resulted in the app telling me I needed only 0.9 gallons of mash water for 15.3 pounds of grain. Fortunately, I knew better and used the right mash water amount. Despite sorting out the temps and amounts, the application crashed after the first of the four mash steps. Re-launching it didn't pick up where it left off, but wanted to start the mash over. There seemed to be no way to move to the next step of the mash (which is where I was at the time), so I ended up having to manually set mash temps from there on. Not a big deal, but it kind of negates the value of the app. After the mash, it became clear that something was wrong. The kettle had little more than 4 gallons in it before the sparge, and just under 6 gallons after the sparge. I would have added water to raise the level, but the wort was way beneath the gravity I calculated too. I decided to just brew as it was. The final gravity was still almost 27 (SG) points below my calculated amount. Although I have often gotten 80% efficiency, today I saw a massive drop. My efficiency was well below 50% on this batch. Going back to my mash and sparge water calculation spreadsheet, I did some re-calculation and discovered that I have been calculating sparge water amounts incorrectly. I updated the spreadsheet and this seemed to give me numbers that matched reality. That should help future brews hit their volume targets more consistently. While the calculation error explains the volume discrepancy, I am still at a loss to explain the efficiency issue. I'd been seeing 80% efficiency fairly consistently, but this batch comes in around 48%. It's something I'll need to sort out. Update 08/12/2017: The beer has been bottled with corn sugar and conditioned for a couple of weeks at 78F to ensure good carbonation. The finished beer is disappointing. Whether this is because I failed to come close to the gravity target (which seems likely) or because it's not a good recipe, I'm not sure. It's drinkable, recognizable as Belgian style, and looks about the right color for Gulden Draak 9000... but that's about all I can say for it. I'm hoping maybe with some aging it will improve, but right now it's at best "OK" and definitely no Gulden Draak 9000 clone as-is. Next time around, I think I would swap out some of the Pilsen malt for Melanoidin and Cara-Pils to improve the body and head retention. I'd also boil longer or make other changes to get the beer closer to the target gravity before adding hops. Could flipping your bottles upside down every day actually fix a lack of carbonation? 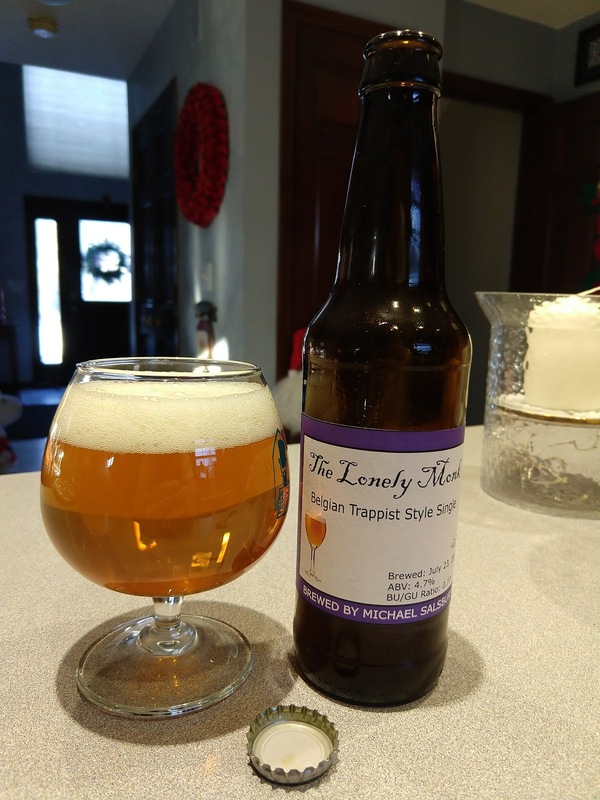 Earlier in my brewing history, I made a really nice Belgian Tripel. It had great flavor and aroma, but came out of the bottle totally flat - not a hint of carbonation. I tried giving it more time, but that didn't work. I tried moving it outside where temperatures were in the lower 80's. No good. After two months, the beer remained flat. I reached out to a home brewing magazine for advice. They suggested opening some of the bottles and pitching in some dry champagne yeast, then shaking the bottle gently to rehydrate the yeast. This, combined with another month, did not solve the problem. Eventually, I poured the flat beer into a uKeg stainless steel growler and force-carbonated it in there. After that, I tried to live by a simple rule. If the beer I brewed was at or below 8% ABV, I would condition it as-is. If it was over 8%, I would pitch in some fresh yeast with the priming sugar. Typically this would be champagne yeast (since it's cheap and generates lots of CO2) or CBC-1 bottle conditioning yeast. This seemed to solve the problem. Fast-forward to today. I had a beer brewed over a month ago which, despite four weeks in a 76-78F environment, was more or less totally flat. Open a bottle and there is no hint of a hiss. I started doing searches and found a suggestion so simple that I wouldn't have believed it could work. It was a no-risk suggestion, so I decided to try it. What was it? Every few days, turn all the bottles upside down (or if they're upside down, right-side-up). This forces the yeast to fall through the beer, which is primed with sugar. Some of the yeast will in theory be roused into life and do some carbonating. Each time you flip the bottle, there should be more active yeast and more carbonating taking place. Last night, I took a 12-ounce bottle and refrigerated it. Popping the cap, I was immediately greeted with the hiss signifying the release of carbon dioxide. It had carbonated at last! If you are encountering an issue where your latest home brew hasn't carbonated properly, I would definitely recommend trying this technique. It seemed to save the day for me. 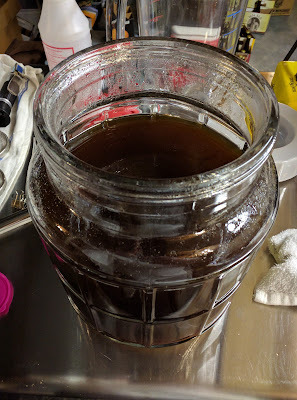 Update 10/08/2017: Recently I had another batch fall victim to undercarbonation. When a bottle of the beer (11.4% ABV or better) is opened, you get the familiar hiss of carbonation. When the beer is poured, however, it's totally flat. These bottles were kept in a 76F container and inverted daily for about three weeks, without any carbonation increase. I then increased the temp to 80F and inverted them daily for another three weeks with no benefit. So clearly this tip does not work in all cases. For information on what I did next, see my post on Rescuing Undercarbonated Beer. I have four stainless steel fermenters. Three are made by SS Brewing Technologies, and have a conical bottom with a valve, dip tube, and thermowell. The last is by Chapman and is a cylindrical shape with a tap near the bottom. They are all good products, but I'm partial to the SS Brewing Technologies fermenters for their conical bottoms (to capture trub and yeast), stackability, and thermowells. Although I purchased it (supposedly) new, one of my SS Brewing Technologies fermenters arrived with a rough white substance on the inside. I suspected that this was beerstone, and was hesitant to use the fermenter for that reason. Beerstone can create pockets for bacteria to thrive in, and it can be difficult or impossible to sanitize that surface well enough to prevent infection. I work too hard on my brews to chance an avoidable infection. Recently, I started reviewing how other home brewers were removing beerstone from their equipment. The recommended solution is a two-stage cleaning with extremely hot water. The first stage uses a phosphoric/nitric acid mixture. The second uses an alkaline cleaner. After using the alkaline cleaner, a very thorough rinse is recommended. Digging around online, finding the recommended acids was difficult if not impossible due to concerns over their hazardous nature. My stand-by cleaner, PBW, is an alkaline one so I figured it might do the trick if I could find the acid mix. Star San contains one of the acids, but not both. I continued to research and found that a number of home brewers swear by Oxiclean. They say that mixing Oxiclean with very hot water and letting the fermenter soak for an hour or two would loosen beerstone and make it easier to remove. I had purchased a 10-pound package of Sodium Percarbonate (one of the active ingredients in Oxiclean) from Amazon a couple of years ago. I use a tablespoon of it in a large quantity of hot water to remove labels from bottles for home brewing, and to remove caked on yeast from the bottom of the bottle before tossing them in the dishwasher. I figured I had little to lose, so I took a small quantity of the chemical (approximately 2 ounces) and put it in the fermenter with the beerstone problem. I then ran the hottest tap water I could into the fermenter until it was full (or at least had a water line above the beerstone). I put the lid on the fermenter and left it for about an hour. When I returned, I removed some of the mixture from the fermenter until I got down to the level of the beerstone. Sadly, I could still see it on the wall of the fermenter. I took out a scrubbing sponge I use to clean my fermenters and scrubbed with moderate pressure. The beerstone removed instantly. By the time I'd scrubbed the entire inner surface of the fermenter, you could no longer see or feel any beerstone in it. If you find beerstone caked in your stainless fermenters, you may want to give this a try.